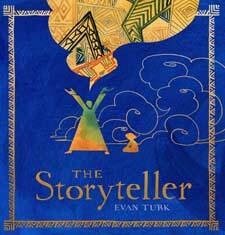 Elizabeth Bird of School Library Journal considers The Storyteller (Atheneum Books for Young Readers) in the current discussion of representation and diverse books in an article for Fuse 8 Production. “There’s been a lot of discussion lately about diversity in children’s literature. Specifically, some of that discussion has concerned those books written by white people about other cultures. It’s not a new phenomenon but what is a bit new is the increasing understanding that if you are going to use another culture, you need to do your homework. If, for example, you are setting a story in Morocco, then you need to make the readers understand why you made that choice. That it wasn’t arbitrary. This is yet another of the many reasons I’m so impressed with Turk’s work here. That he sets his story in Morocco (contemporary Morocco, by the look of it) is deeply purposeful. The Author’s Note at the end explains further. From this we learn that Morocco’s public storytellers or hlaykia have told tales for “nearly one thousand years” and yet “Only a handful of master storytellers remain”. All is not lost, though. Renewed interest in storytelling has surfaced, specifically at a restaurant called Café Clock in Marrakech. Turk then closes with a small Bibliography of sources on everything from storytelling to carpet weaving.